SANYO Vero by KYOCERA has been announced by Sprint. The mobile phone comes with a large screen and key pad with the ability to make your menus larger for additional ease of use. The extremely light clamshell has all the key mobile features, including a large, 2.4-inch QVGA display with 1.3-inch glow-thru OLED sub-display, 1.3MP camera and generous battery life. 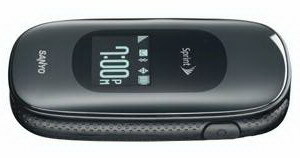 The handset features a “grippable” soft-black finish and an external OLED glow-thru display for caller ID and clock. Once flipped open, Vero’s extra-large key pad enables quick and easy messaging and the 240x320-pixel internal color display makes it easy to view threaded text and multimedia messages. The 840 mAH lithium ion battery provides 5.2 hours of continuous talk time. Sprint Sanyo Vero also comes with Stereo Bluetooth, SMS Threaded text messaging, 2.5 mm headset jack, and 36 built-in ring tones, offering a variety of traditional ring tones as well as polyphonic melodic ring tones (up to 72 chords) and vibrating alert. The mobile phone costs $10 with a contract and after mail-in-rebates. 0 comments on "Sprint Sanyo Vero announced"